If you have a personal Google account, confirm that you have switched to your CIA Google account. Otherwise you will not see what has been shared with you for Major Acceptance. You will not have many sheets to choose from unless you regularly use Google Spreadsheets or have multiple sheets shared with you by others in the CIA community. Since the Department sheet is shared with you a quick way to find it is to display sheets "Not owned by me." Double Click the sheet to open it. The number of students applying are tallied for convenience only. If a student is interviewed but not listed on the spreadsheet, DO NOT ADD THEM to the list. Notify Academic Affairs BEFORE MARKING ANY STUDENT'S STATUS. Note: You are only editing three columns; Status, Notes, and Wait List Rank. 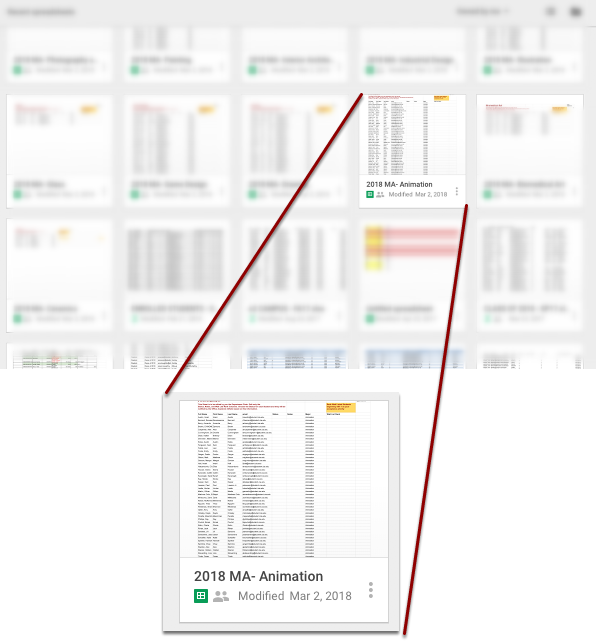 Academic Affairs has access to a spreadsheet which is collecting all of the MA- Major sheets. This sheet is collecting the Name and email data from a master repository sheet. You won't be able to change that information. After the interview simply mark the student's status on the spreadsheet. What you see is the information that will be used by Academic Affairs when contacting students. Status fields have 5 options available. Notes fields should only be completed when conditions apply to a student's acceptance. The compiled information from all Major Acceptance spreadsheets will be used by Academic Affairs to create a mailing list. After students are notified of your decision they will submit their final decisions via an online form. The MA- Major sheet will update automatically with the name of those students choosing your Major. Their names and email addresses will be found in the Major Student Acceptance tab. This tab is a split view and Duplicates what is seen in the Major Acceptance Report Tab for reference while reviewing the Wait List Report. Looking for Information about the Wait List Process?